The molecular basis for MAPK4 binding to AKT, part 2. (A) The FLAG-tagged MAPK4 and MAPK4E/D5A (5A-FLAG) mutant were transduced into HEK293T cells with or without cotransfection of AKT1. Immunoprecipitation was performed using anti-FLAG M2 affinity gel followed by Western blots using anti-AKT antibody. The MAPK4E/D5A (5A-FLAG) mutant carries AAAKAA in place of the potential CD motif EEDKDE. (B) FLAG-tagged WT MAPK4 and the MAPK4E250A, MAPK4E251A, MAPK4D252A, MAPK4D254A, MAPK4E255A mutants were transfected into HEK293T cells together with AKT1. Immunoprecipitation was performed using anti-FLAG M2 affinity gel followed by Western blots using anti-AKT antibody. (C) FLAG-tagged WT MAPK4 (WT) and the MAPK4D254A, MAPK4E255A mutants were transfected into the HCT116 MAPK4-KO cells. Phosphorylation of AKT was detected with Western blots. Data are representative of at least 3 independent experiments. (D) Sequence alignments of 13 human MAP kinases using T-Coffee and ESPript (34, 35). (E) Alignment of MAPK4 protein sequence around the CD motif across species. 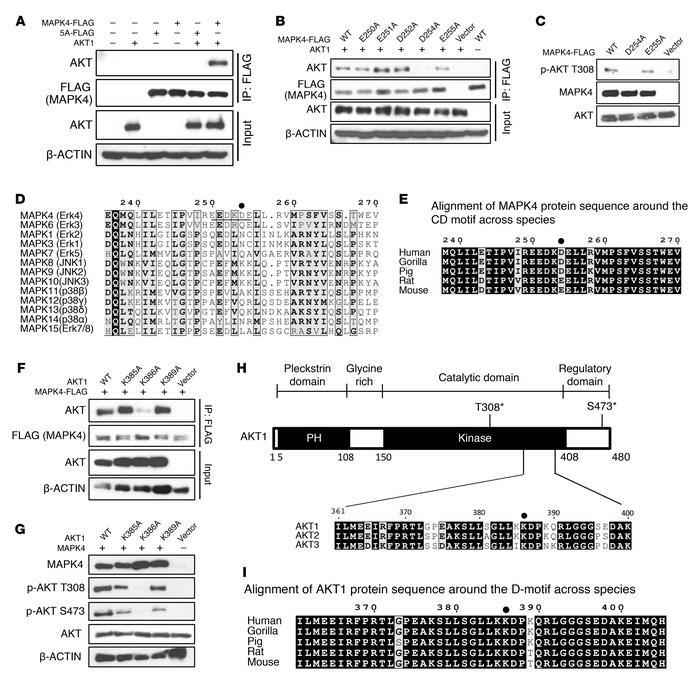 (F) WT AKT1 and the AKT1K385A, AKT1K386A, and AKT1K389A mutants were transduced into HCT116 cells together with FLAG-tagged MAPK4. Immunoprecipitation was performed using anti-FLAG M2 affinity gel followed by Western blots using anti-AKT antibody. (G) WT AKT1 and the AKT1K385A, AKT1K386A, and AKT1K389A mutants were transfected into the HCT116 PDK1-KO cells. Phosphorylation of AKT was detected with Western blots. Data are representative of at least 3 independent experiments. (H) The domain architecture of human AKT1 and the sequence alignment of human AKT1, AKT2, and AKT3 proteins. (I) Alignment of AKT1 protein sequence around the D-motif across species.